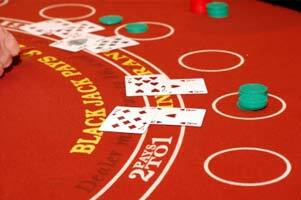 Basic Blackjack strategy is helpful for every Blackjack player. If you want to increase the chances of winnings, you should follow basic blackjack strategy. You should know it to handle proper distribution of cards in deck. The below table is basic blackjack strategy which is made for 4 and it is helpful when the dealer is standing in soft 17. It is the most common type of blackjack variant. This is the kind of multiple deck game and it is mostly applicable when the dealer is standing in 17 or the game is multiple deck game with 4. This chart can help to remember strategy for blackjack game. These strategies can help you to play any type of blackjack game at any circumstances. You can simply take a print out of this strategy and keep it near to your computer. It will help to increase the chances of winnings. You can minimize the edge of the casinos. If you want to use basic strategy of blackjack you just need to look up at the left side vertical edge of the and also the dealer's card alongside the top. 'A' suggests Ace in both cases. Soft hand totals, blackjack hard totals etc are from top to bottom accordingly. There are some effects on some borderline situation in blackjack rule. There are some changes in blackjack rules which is number of the decks used like if the dealer stands or hits in soft 17 or if any double down is allowed when splitting a hand is completed or not.